Access your computers remotely. Anytime. Anywhere. RealVNC® is ideal for simple and secure remote working, customer helpdesk, IT support, systems maintenance, classroom learning, training, collaboration and more. Across desktop and mobile. 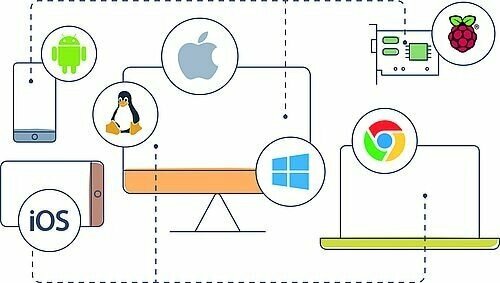 RealVNC® is a remote access and control software for an unrivalled mix of Windows, Mac, UNIX and Linux computers. With a simple peer-to-peer architecture, no agents or centralized servers are required. It is the ideal solution for simple and secure remote working, customer helpdesk, IT support, systems maintenance, classroom learning, training, collaboration and more. Across desktop and mobile. RealVNC® is used by millions of people worldwide to improve the operational efficiency of their business. It helps organisations cut the cost and improve the quality of supporting remote computer systems. The RealVNC software reduces the expense and risk of field service activities, minimizes downtime, and cuts the number of repeat calls. It enables your customers to comply with regulatory obligations and creates compelling new revenue opportunities. Whether they work in enterprise IT, consumer electronics, automotive, healthcare, telecommunications or manufacturing, RealVNC connects their business. To get started, download RealVNC to the computer you want to control, install it, and choose a license. Then, download RealVNC Viewer to the computer you wish to exercise control from. Note if you are connecting over the Internet, you may also need to configure your network. Richly-featured, strongly-secure remote control for personal and for small-scale commercial use. Fully-featured, ultra-secure, easily-administered remote control for personal and for medium and large-scale commercial use.